A beautiful new paperback edition of this classic poetry collection. 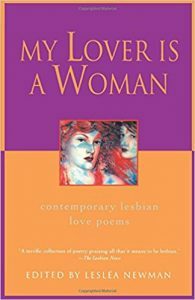 Three hundred pages of gorgeous love poems by Dorothy Allison, Becky Birtha, Chrystos, Jewelle Gomez, Judy Grahn, Audre Lorde, Cherie Moraga, Pat Parker, Minnie Bruce Pratt, Kate Rushin, Linda Smukler, Kitty Tsui, Terry Wolverton, Shay Youngblood and many others. The perfect gift for your lover… or for yourself.